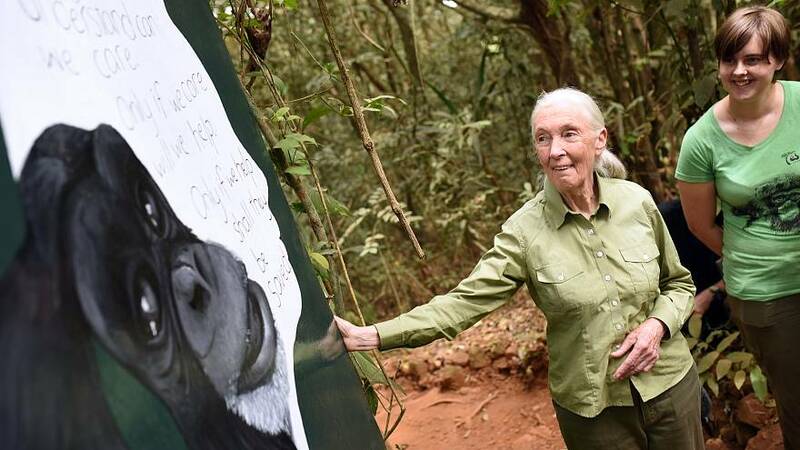 Iconic primatologist Jane Goodall spoke to Euronews correspondent Shona Murray on a recent visit to Brussels to talk the differences or rather similarities between chimpanzees and humans, her work on conservation and her hopes for the future of planet earth. "We share 98.6 of the composition of DNA and the scientists tell me that the main difference lies in the expression of the genes. It’s a common misperception that we evolved from apes. Som about 6 million years ago there was an ape like, human like common ancestor and from that common ancestor, one path was taken by humans and the other by the great apes. It makes me feel sick to my stomach - that’s why I’m 300 days of the year on the road, that's why I'm meeting with CEOs of companies and sometimes going to parliaments talking and working specially with the youth...and the danger is that people get angry and then they become violent. It doesn't get you anywhere and I found the only way that you can to change somebody is to get to the heart, and the way to get to the heart is telling stories. Mostly when somebody is an animal activist, they go to meet somebody like the head of some company that is using animal testing, they are very aggressive and pointing fingers. Actually it doesn't help, it makes the people embattled, they end up putting walls up, like Trump's wall in Mexico. If you don’t talk to people, how do you expect them to change? I would show them films of chimpanzees and tell them the stories that I have learned over the years. I'm so horrified by what we are doing in the factory farms. There's a pig, not Picasso but Pig Casso. Pig Casso was rescued from slaughter in Cape Town . He was rescued by an artist who has a little sanctuary for farm animals. The artist noticed that Pig Casso was watching eaglely as she painted, so she gave Pig Casso an easel and a paintbrush. This pig loves painting!! And I show it to people and the other day somebody said I hate you - I said what you mean? Well, I can’t eat bacon anymore! We have a window of time, it can’t be the youth only. We all have to get together. Nature is a resilient, we can destroy a place and give it time, then nature can come back. And there’s the indomitable human spirit, the people who tackle what seems impossible. Yes, I have hope, but the window is closing all the time.